Home Celebrity Popular Nigerian actress, Eniola Badmus’s Statement For Body Shame. Popular Nigerian actress, Eniola Badmus, recently reacted to body shamers on her social media account after some of them trolled her because of body size. 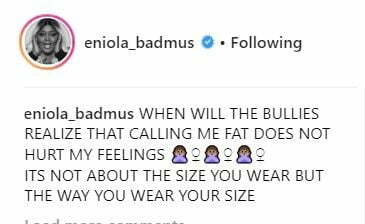 Badmus, took to Instagram account to claim that she does not care what ever she is being called, she said, ‘calling me fat does not hurt my feelings’. She further stated, ‘its not about the size you wear, its about how you wear it’. Nigerian actress,Rita Dominic looked quite stunning as she was spotted in a Muslim regalia recently.